In 1980, the Soviet Union hosted the Summer Olympics in Moscow. Times were different back then. Athletic shorts were shorter. And the posters were… awesome! We’ve dug up a few of these rare specimens for you to flip through, lightly annotated for context. Behold the wonders of their minimal design, awkward tangent propaganda, and bears. 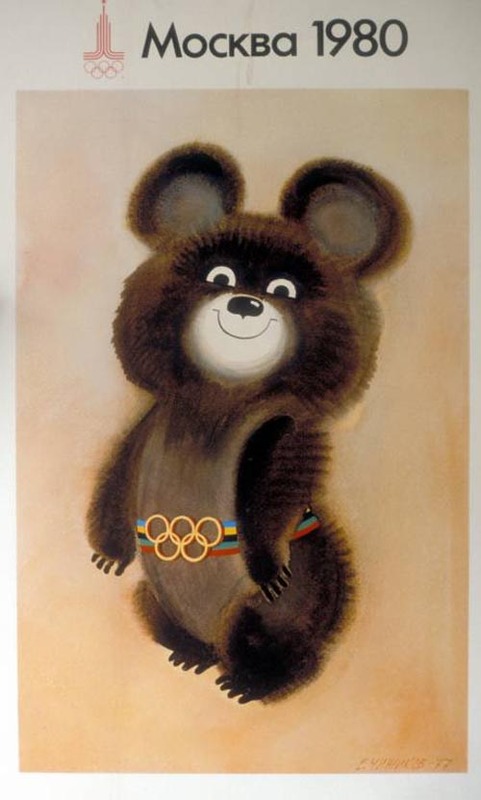 Meet Mishka, the Soviet Olympic Mascot, the definitive bear of all of USSR. He’s like Paddington Bear, but he comes in a giant floating balloon. Yeah, take that, London. Best wishes from MISHKA.Misha dominates all of the pictograms. “Olympian year — not just for Olympians.” Keep working, comrades. Give us a good quality work! 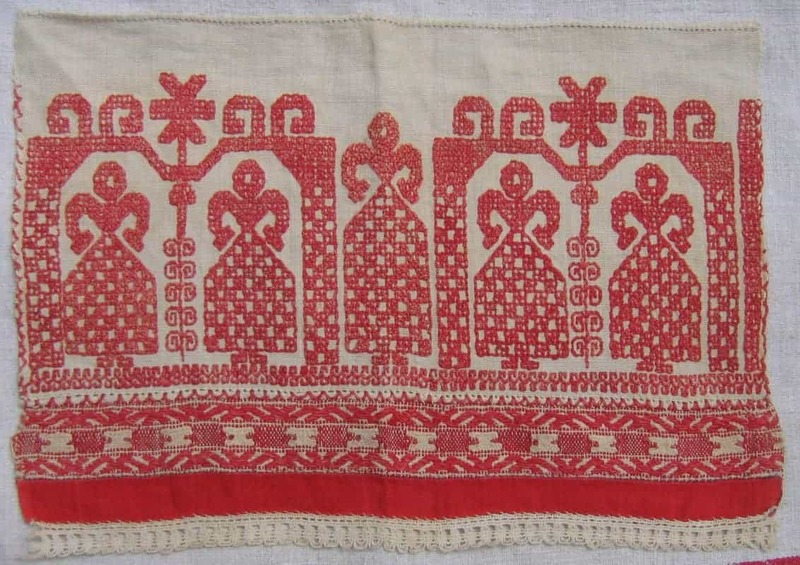 Naturally, the international community will respond positively to posters that look like SlavicDECORATIVE TOWELS. These are “welcome flowers” for the foreign visitors. They are red, naturally. Names of different countries... Misha is back and he stole several children from different countries. This is when housing project-style architecture was really, really hot. 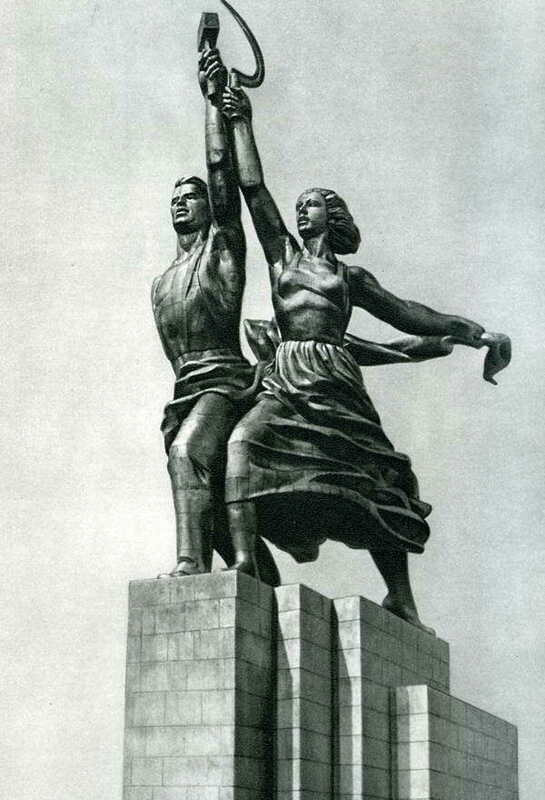 A statue-inspired Soviet sport: Mixed gymnastic synchronized torch-running. Ah, minimalism. Also, don’t forget to harvest your wheat at the communal farm this season. Never forget about the communal farm. “From the depths of time, to the Olympics of today.” Now, with more wheat. Best ice cream cone ever? The 1979 Soviet invasion of Afghanistan spurred Jimmy Carter to issue an ultimatum on January 20, 1980 that the United States would boycott the Moscow Olympics if Soviet troops did not withdraw from Afghanistan within one month. The pros and cons of the boycott were further discussed in several interventions at the 1980 Bilderberg meeting held towards the end of April in Aachen. The debate partly surrounded the perception that the action could be perceived on the worldwide stage as a sentimental rather than a strategic act. An African representative at the event stated that a boycott would be an effective symbolic protest because of its dramatic visibility to the citizens of the Soviet Union, regardless of whether or not the action provoked a response. The United States was joined in the boycott by some other countries – including Japan, West Germany, China, the Philippines, Argentina and Canada. Some of these countries competed at theOlympic Boycott Games in Philadelphia. Notably, United Kingdom, France and Australia supported the boycott but allowed their athletes to participate if they wished and left the final decisions to participate in the Games to their respective National Olympic Committees and the individual athletes of the countries concerned. The United Kingdom and France sent a much smaller delegation of athletes than usual. Nevertheless, the delegation of the United Kingdom was the largest among Western Europe, with 170 athletes applying to compete. Spain, Italy, Sweden, Iceland and Finland were other principal nations representing western Europe, though Italian athletes belonging to military corps did not attend the Games, due to the government's support of the boycott, which severely affected many events. Some American-born athletes who were citizens of other countries, such as Italy and Australia, did compete in Moscow. 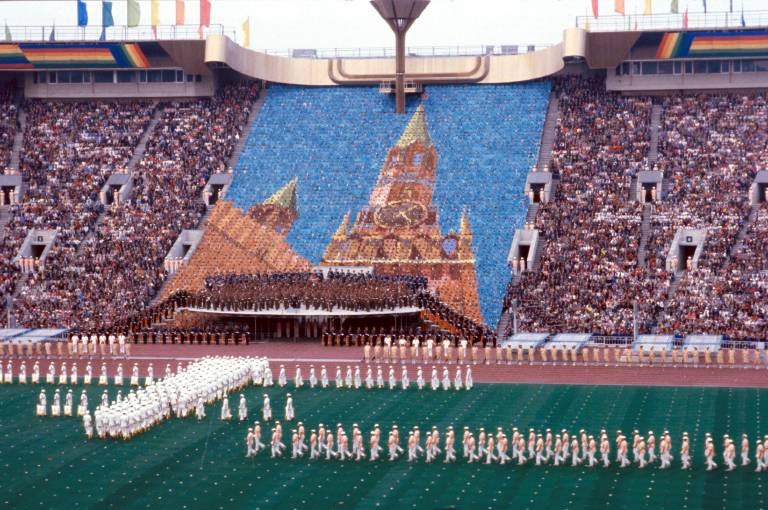 At the Opening and Closing Ceremonies, athletes from a number of countries, including Australia, Andorra, Belgium, Denmark, France, United Kingdom, Ireland, Italy, Luxembourg, the Netherlands, Portugal, Puerto Rico, San Marino, Spain, and Switzerland, marched under the Olympic Flag, instead of their national flags, a fact that the Soviet TV coverage alternately ignored. Moreover, although the government of New Zealand officially supported the boycott, four athletes from that country competed independently and marched under their NOC's flag. Altogether, the athletes of 16 countries were not represented by their national flags, and the Olympic Anthem replaced their national anthems at medal ceremonies. As a result, there were a few ceremonies where three Olympic Flags were raised. Because Montreal mayor Jean Drapeau was unable to travel to Moscow due to the boycott, Sandra Henderson and Stéphane Préfontaine, the final torchbearers at the previous games, were sent in his stead to participate in the Antwerp Ceremony at the opening ceremony, and at the closing ceremony, the Los Angeles city flag – rather than the United States flag – was raised to symbolize the next host of the Olympic Games. Even though only 80 nations participated, more world records were set in Moscow than in 1976 in Montreal. The significance has less to do with the quantity of absentees — possibly as low as 45, maybe as high as 60-plus — than with the quality. The United States led the boycott and were supported by Canada, West Germany, Japan, China, Kenya and more. A total of 80 nations competed — the lowest since 1956 — and some did so under the Olympic flag rather than their own. So the scene was set for some unfamiliar names to make their mark, and none more so than Zimbabwe. As Rhodesia, the African nation had been banned from the previous two Games. It returned with a new identity, free of apartheid and good enough to win the inaugural women's hockey gold medal, albeit in something of a makeshift competition. The hosts won at least one gold medal for every sport except hockey, in which India won the last of their men's gold medals, and football, won by Czechoslovakia. 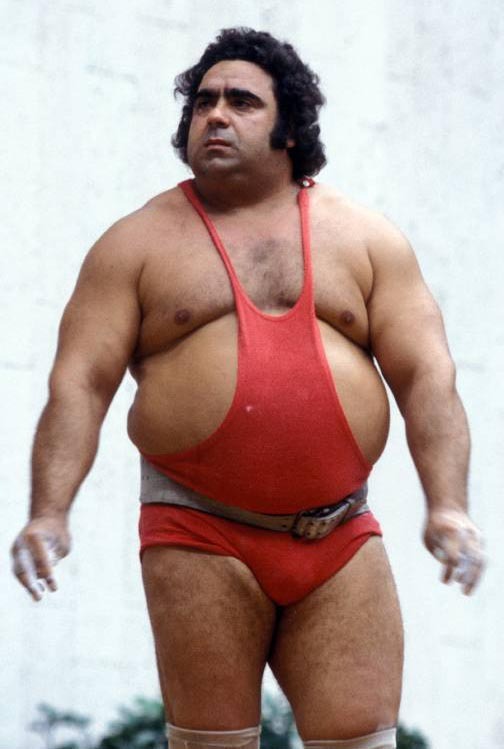 Weightlifting legend Vasily AlekseyevEvery gymnastics medal went to eastern Europe. Nadia Comăneci won two golds and two silvers for Romania in her last Games and there were two golds for Soviet star Nellie Kim. 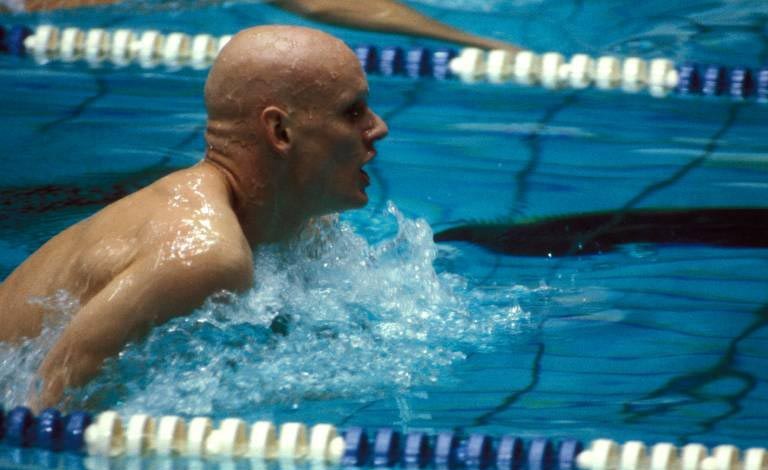 Nikolai Andrianov won two golds, two silvers and a bronze to take his medal total to 15 from three Games, a men's record beaten only by Michael Phelps. His team mate Alexander Dityatin won a medal in each of the gymnastics events, his record of eight medals in one Games again matched only by Phelps. East Germany won 11 out of 14 rowing golds and all but two of the women's swimming gold medals. In boxing the Soviets were beaten into second place by Cuba, literally in the case of Téofilo Stevenson, the big-hitter who defeated Piotr Zaev to become the first fighter to win three consecutive heavyweight gold medals. The next boycott, of Los Angeles in 1984, would deny him the chance of a fourth success. Viktor Saneev came up short in his bid for a fourth consecutive triple jump gold, but there were suggestions it took some dubious "foul" calls against his opponents, by Soviet judges, for the champion to even achieve silver. 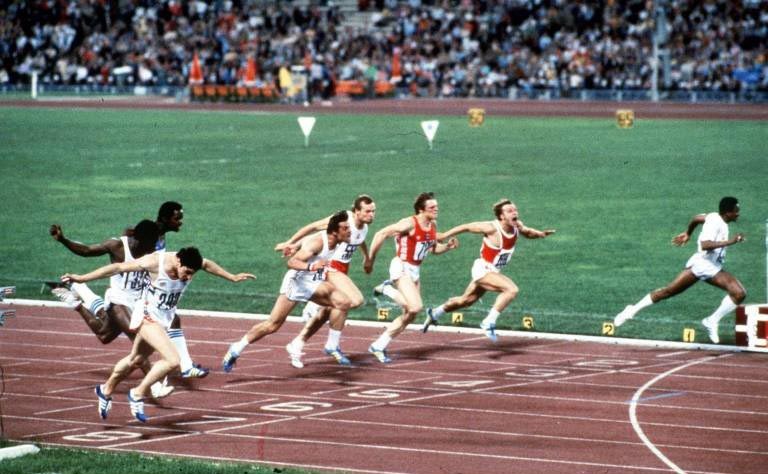 Steve Ovett beats Sebastian Coe at 800mWaldemar Cierpinski of East Germany won a second successive marathon. 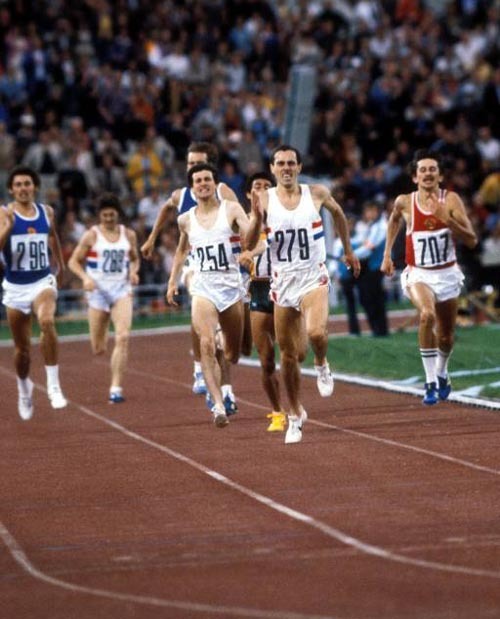 Allan Wells became the first British winner of the 100m since Harold Abrahams in 1924 and two great rivals provided further British success, Steve Ovett at 800m and Sebastian — now Lord — Coe at 1,500m. Miruts Yifter, who was denied the chance to improve on his 10,000m bronze in Munich by Ethiopia's boycott of Montreal, returned to win that event and the 5,000m. There were a number of twin successes. Sergei Beloglazov won freestyle wrestling gold at bantamweight and twin Anatoli conquered the flyweight class. Walter and Ullrich Diessner were members of East Germany's successful coxed four. Their compatriots Jörg and Bernd Landvoigt beat the Soviet twins Yuri and Nikolay Pimenov to win the coxless pairs. They would be followed by a twin disappointment when the Soviets responded to the American-led boycott of the Moscow Olympics by leading east European nations and a few other sympathisers in their own boycott when the 1984 Games went to Los Angeles. 1-Miruts Yifter (ETH) - Doubled up with golds in the 5000m and 10000m. 2-Teofilo Stevenson (CUB) - The Cuban amateur boxing legend won his third heavyweight gold. 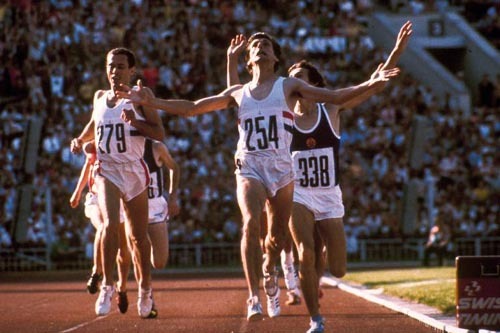 3-Steve Ovett and Sebastian Coe (GBR) - Split the glory at 800m and 1500m, each winning the other's stronger event. The USA led a boycott of the Games in protest at the Soviet invasion of Afghanistan. British athletes were allowed to compete, but only under the Olympic Flag. 21 per cent of the competitors were female, more than at any previous Olympics. Austrian rider Elisabeth Theurer was ordered not to compete by her national federation. However, F1 star Niki Lauda flew her to Moscow in his private jet and she duly won gold. "A family movie night can be a fun way to spend an evening. One of the issues that we have in our family is the 5 year age difference between our children. However, there are some great family classics out there that appeal to the whole crowd." The Sound of Music offers a love story mixed with tragedy. Captain Von Trapp is the father of seven children and Maria enters their life as the nanny. Through her love of music, Maria wins over the children and Captain Von Trapp. The movie is full of wonderful songs that the whole family will enjoy. All three of the Toy Story movies should make your list of must see movies. The movies follow the adventures of a little boy named Andy’s toys. With fabulous animation and witty lines that parents will appreciate, the films are heartwarming, fun, and offer enjoyment for people of all ages. In Finding Nemo, Marlin, an overprotective father clownfish loses his son Nemo. Throughout the movie you follow both Nemo and Marlin through their various adventures. The movie is thoughtful and fun. The Lion King offers the story of a baby lion, Simba, who will one day become the king. However, after his father passes away, his evil Uncle Scar takes over the kingdom and ruins it. Over time, Simba realizes that it is his responsibility to take over the kingdom. Marry Poppins offers a wonderful, magical story about two young children who get very little attention from their parents. Mary Poppins takes the children on several wonderful adventures. The movie offers wonderful song and dance numbers that the whole family will enjoy. The Shrek movies offer the story of an ogre who rescues a princess and ends up finding true love. All of the Shrek movies are full of humor and fun and offer a unique spin on the classic fairy tale. The film is also very enjoyable for parents, as the story line includes several clever references that adults will find entertaining. The Incredibles are a family of superheroes, each with their own unique powers. The family is currently “retired” from the superhero business. The movie is what you would expect from a superhero film, offering great action along with well timed humor. Willy Wonka is about a little boy named Charlie who wins a trip inside a chocolate factory. The movie is whimsical, fun and full of surprises for the children on the tour. It also teaches children that it is important to follow the rules. Elliott, a young boy, discovers an alien who was left behind by his fellow extraterrestrials. The boy and the alien form a bond throughout the movie as Elliott helps E.T. get back home. Around the holidays you cannot avoid seeing this wonderful, charming, and classic film. The story is about a boy named Ralphie who has one wish for Christmas, which is to get a Red Ryder BB gun. The film is full of wonderful family fun. 12 of the best free tools for your own business. Anita Hovey - social media consultant and trainer at her own company Twirp Communications. Thank you for reading this article. I hope you found it interesting and helpful.